Christ in Majesty flanked by the Virgin and St. John, adored by five saintly figures. 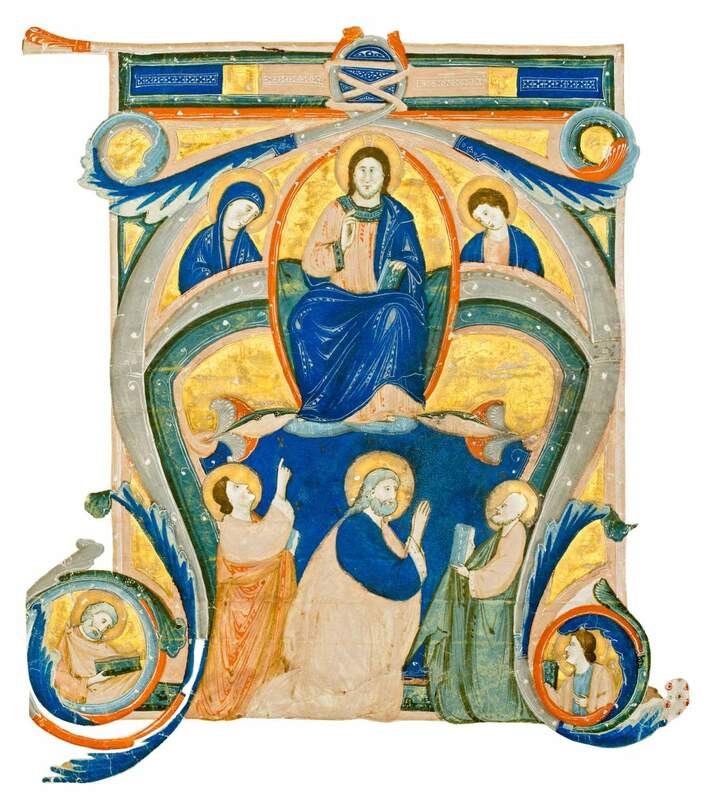 Historiated initial A from an Antiphonal, illuminated by Neri da Rimini. This historiated initial A probably served as the frontispiece of an impressive series of choir books, which were likely produced for an important Dominican house in the Emilia Romagna region where Rimini is found. These books could have perhaps been connected to the (no longer extant) Dominican Church of San Cataldo in Rimini. ‘Behold, from afar I see the coming power of God’. One of the most famous responsories, the words sung here celebrate the physical presence of Christ in the world. Neri da Rimini, the artist responsible for the decoration of this leaf and many of its companions, was one of the leading figures in the history of 14th-century Italian manuscript illumination. Amongst his contemporaries in the Riminese school who worked in various artistic media, Neri is the sole and rare example of an artist singularly focussed on manuscript illumination.